An ecosystem is a biotic community together with its physical environment, considered as an integrated unit. Implied within this definition is the concept of a structural and functional whole unified through life processes. An ecosystem may be characterized as a viable unit of community and interactive habitat. Ecosystems are hierarchical and can be viewed as nested sets of open systems in which physical, chemical, and biological processes form interactive subsystems. Some ecosystems are microscopic and the largest comprises the biosphere. Ecosystem restoration can be directed at different-sized ecosystems within the nested set, and many encompass multiple states, more localized watersheds, or a smaller complex of aquatic habitat. 1. Definition source - US Army Corps of Engineers EP 1165-2-502, Supporting Policy Information for Ecosystem Restoration. Spring, creeks, rivers, lakes, marshes & waterholes. An area or region of land designated for study purposes that has distinct characteristics setting it apart from others. In the Mojave, two general ecosections, separated by geomorphic boundaries, are further classified into ecosubsections. 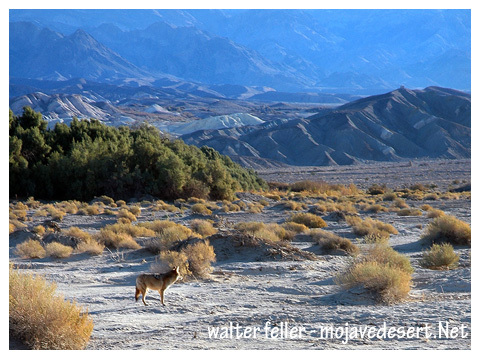 Deserts host plants and animals living in what strikes many humans as oppressive environments. Solar energy that green plants convert into food fuels life here. Although in most ecosystems plants compete for sunlight, here most plants are adapted to minimize the effects of too much solar energy. Habitats are environments that are inhabited by a specific plant species or animal. Specific plant and animal species, and communities within, and around desert ecosystems. A major biotic community characterized by the dominant forms of plant life and the prevailing climate. The study of the natural interaction of organisms to one another within their environment.